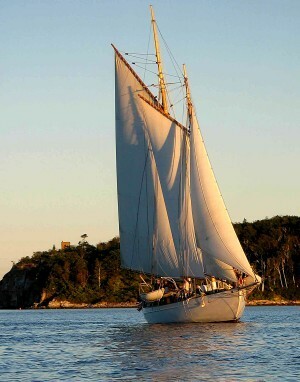 Now that we’re into June, our friends at Portland Schooner have begun their season, and the two beautiful antique schooners are in the waters of Casco Bay, ready for your two-hour cruise among the nearby islands and lighthouses. Here at Brewster House, that also means that it is time for our schooner sailing packages to begin. Our summer package, Sail into the Sunset, including two nights at Brewster House, dinner right down the street at the wonderful Azure Cafe, a two-hour sunset cruise (or other cruise, if you prefer), and a gift certificate at L.L. Bean, helps to fill your visit with a variety of Maine activities. The ever-popular Fall Foliage Surf & Turf package begins September 17, and continues through October (the schooner sails are subject to availability – if not available, the cost will be deducted from your bill). That is the package that has twice been featured in Smarter Travel, who called it “a steal of a deal.” This special includes all the components of the Sail into the Sunset package, plus a detailed booklet with detailed driving directions to some of the best foliage areas, and a $50 gasoline card to help with the driving costs. It’s not too early to book your Sail into the Sunset or Fall Foliage Surf & Turf package. October is also homecoming for the local colleges, as well as their parents/families reunions weekends, so rooms are already filling up – in the midst of the best foliage season (the first three weeks of October).